Mr. Meyvis was born in St. Giles-Waes Belgium then migrated to East Rochester New York in 1902 becoming part of a group of artists called the Fingerlakes Regional artists. 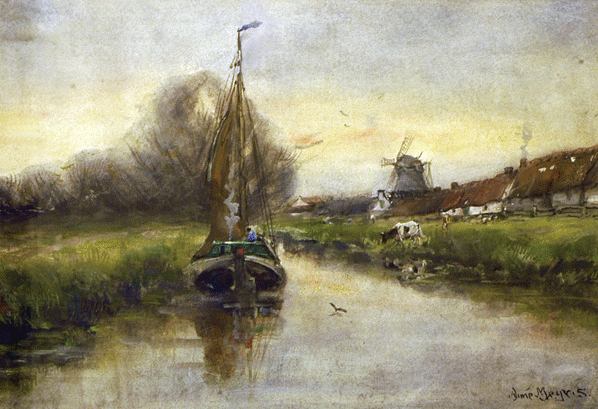 While spending time in Holland the artist studied at The Royal Academy in The Hague Holland. His art was chosen in the 3rd Exhibition of Contemporary Artists Washington, D.C., The National Academy of Design, The Pennsylvania Academy Of Fine Art, The Art Institute of Chicago and The Rochester Art Club. He is listed in The Artists Blue Book, Who' Who in American Art, Fileding's Dictionary, Mallett Index of Artists and Davenport's. Although he primarily worked in the medium of oil, this wonderful gem illustrates his diverse artistic ability using mixed media, creating a masterful composition of scerenity and charm.